A gorgeous baby girl gift basket packed full of beautiful co-ordinating organic clothing from award winning Frugi Organics including a beautiful 100% cotton babygrow and a super soft bodysuit, soft leather shoes handmade in the UK, a quality Baby's 1st Teddy Bear and Teddy Bear Comfort Blankie from Russ Berrie, and a bottle of organic Earth Friendly Baby Body Lotion. A big and beautiful Wicker Gift Basket bursting with gifts for everyone involved in this joyous occasion, including a collection of beautiful and practical organic baby wear essentials, muslin swaddles, award winning toys, 100% Natural bath and body products for baby, all rounded off with a box of chocolates for the new parents. 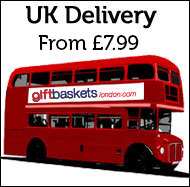 As its name suggests this Basket will be special delivery number two!